(CBS) NEW YORK - A second suspect in the assault of a man by a group of bikerswhile he was driving with his family on a New York City highway is now in custody, reports CBS New York. An unidentified suspect surrendered to police Tuesday. He is suspected of punching out the windshield of a Range Rover in the incident. He had not been charged as of late Tuesday afternoon, according to the station. Earlier Tuesday it was reported that one suspect had been arrested.Christopher Cruz, 28, is charged with reckless endangerment, reckless driving, endangering the welfare of a child and menacing in the incident, police said. 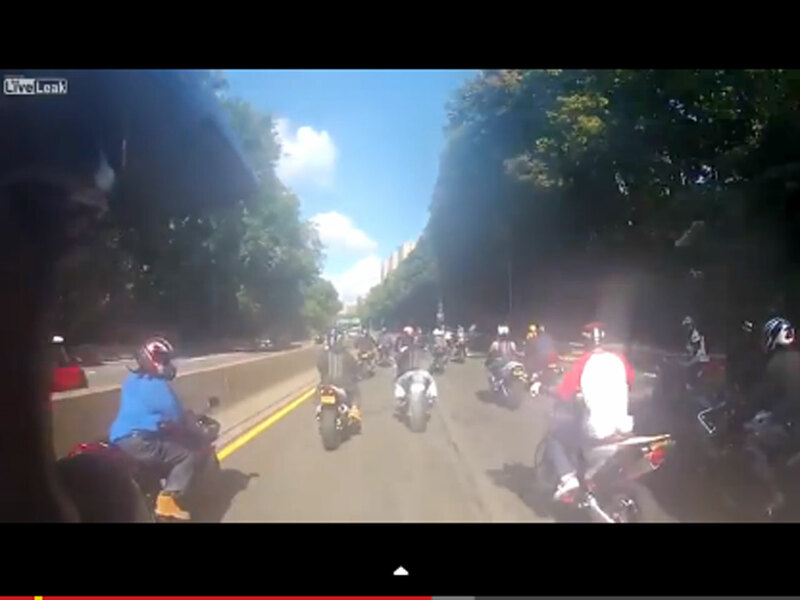 The assault on 33-year-old Alexian Lien began around 1:30 p.m. Sunday on the West Side Highway after he got into an accident with one of the bikers around 125th Street. Lien the took off in the SUV. Lien, who was traveling with his wife and toddler, struck two of he bikers while fleeing, police said. The other bikers, perhaps 30 or 30 of them, gave chase, pursuing him for about 2 1/2 miles, and again surrounded the vehicle. They pulled the man from the SUV and beat him, police said. Lien was taken to a hospital where he required stitches to his face. His wife and child were not injured. Authorities say they are still looking to make more arrests as they sort through the chaos, which was captured on video and posted online. Police said one biker, identified as Edwin Mieses, suffered two broken legs when the SUV ran over him and another biker suffered a leg injury. Lien has not been charged. Mieses, an aspiring rapper from outside Boston, was reportedly in a medically-induced coma Tuesday with crushed legs and serious internal injuries. "There's no hope for his back. They crushed his spine -- broke it in two different places -- so he will be forever, forever paralyzed," his wife, Dayana Mejia-Meises, told CBS Boston. Mejia-Mieses said her husband got off his bike to help another biker who was hit in the initial collision. "When all the bikers stopped, my husband got out, parked his bike to walk over to try to help his friend. He walked over towards the front of the vehicle when, at this point, I don't know what happened the man was scared, the man just peeled off and ran over my husband," she told the station. The couple has two children, ages 15 and 9, reports the station. Mejia-Meises says Lien should be charged. "He needs to pay for what he did," she said. On Tuesday, New York City Police Commissioner Ray Kelly held open the possibility that Lien might be charged, reports CBS New York. "You have to look at the totality of the circumstances and that's what we're doing," Kelly said. Kelly said the video is invaluable evidence of helping them sort through a complex set of actions and reactions.